Identification Guide to the Inshore Fish of the British Isles, by Dr Peter Henderson of Pisces Conservation is a comprehensive photographic guide to the coastal fish of the British Isles. 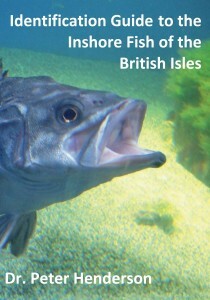 The book is aimed at anglers, marine biologists, ecologists and students interested in British fish. 178 species of fish are given a full description, with over 100 other species mentioned in the text. It is the definitive guide to the British marine fish, and will also be invaluable for users all round northern Europe. Click to preview Chapter11 – Codfishes. Read a review of the book in the FSBI newsletter, Spring 2015.